The Encyclopedia of Membrane Proteins Analyzed by Structure and Symmetry (EncoMPASS) is an automated database for relating integral membrane proteins of known structure from the points of view of their sequence, structure, and quaternary and internal symmetries. Analysis is presented for all membrane-spanning PDB entries, and separately for all membrane-spanning chains found therein. Only X-ray crystallographic structures with resolution ≤3.5Å are included. To browse the contents, use the search bar to enter the PDB code of a membrane protein structure e.g. 4hea, or of a single membrane-embedded polypeptide chain, e.g. 4hea_N. If you use EncoMPASS, please cite: Aleksandrova, A. A., Sarti, E., & Forrest, L. R. (2018). EncoMPASS: an Encyclopedia of Membrane Proteins Analyzed by Structure and Symmetry. bioRxiv. doi:10.1101/391961. Sarti, E., Aleksandrova A. A., Ganta, S. K., Yavatkar, A. S., Forrest, L. R. (2018). 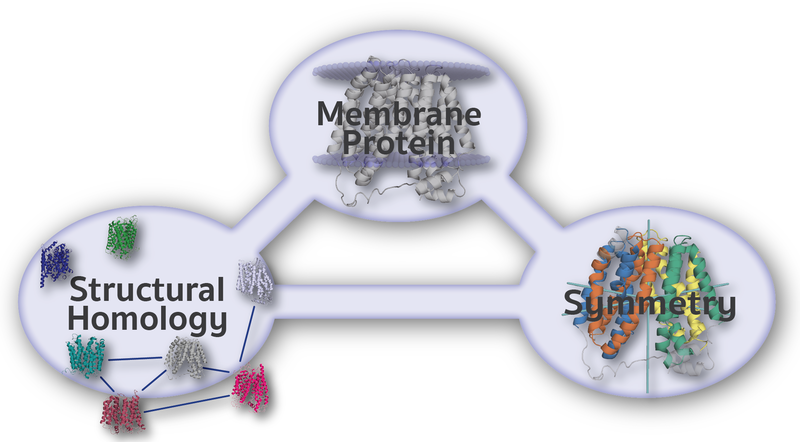 EncoMPASS: an online database for analyzing structure and symmetry in membrane proteins. Nucleic Acids Res. doi:10.1093/nar/gky952. The EncoMPASS database was compiled by Antoniya A. Aleksandrova and Edoardo Sarti from the Forrest lab. The database search engine and website were built by Srujan K. Ganta and Amarendra S. Yavatkar of the Bioinformatics Section, Intramural IT and Bioinformatics Program (DIR) of the National Institute of Neurological Disorders and Stroke, NIH. For inquiries, please contact lucy.forrest@nih.gov.